Are you about to take the Cambridge ESOL Delta Module One exam? This is the first in a series of articles which will look in detail at all the tasks in exam, to make sure you understand the exam requirements and can avoid some of the most common mistakes made by candidates. The articles are written by Sue Swift, who has taught on Cambridge English Diploma exam courses for over 35 years and currently runs on-line and face to face courses for all three modules of the Delta scheme. Find out more about them by clicking on the link in the sidebar. To pass the Delta Module One Exam, you have to know your stuff. But you also have to know how to get it all down on paper in the time allowed, and in the format that will get you the maximum marks without wasting time. So in this section of the Notebook we’ll be posting a series of articles to check you understand the requirements of each question, and to provide a few exam tips. And if you stick with us, at the end there’ll be a link to a quiz where you can test that you’ve remembered everything. First of all then, here are some general comments. The exam consists of two papers, taken on the same morning (always the first Wednesday in June and December). Each paper lasts 90 minutes, and you'll have a 30-45 minute break in between. There are 100 marks for each paper and you have to get a cumulative 50% to pass. In other words, it doesn't matter where you get the marks - you could do one paper brilliantly and the other very badly, but as long as the total marks were over 50% you'd pass. So - 100+ marks to get in 180 mins, which means that to ensure a bare pass mark you need to aim for approximately one mark every one minute forty seconds. More if you're aiming for a merit or distinction. One mark every minute and a half and you'd get only 90 marks - which means a fail. Let's say a mark a minute. Sounds tough? Keep in mind that you're not asked to write essays, and frequently not even full sentences. Concentrate on getting down the points you need to make, using semi-note form, lists and bullet points. If you try to answer the questions in essay form, you'll waste a lot of time without gaining any marks. As we look at each of the individual tasks on the papers, we'll look too at the format you might use. b) There are sometimes alternative terms for the same thing. Plosives can also be called stops, washback is also known as backwash, Community Language Learning is also called Counseling Language Learning, and so on. However, only one of the terms is required – if they are standard alternatives either will be accepted. If you put down both and they’re both right, you won’t gain anything but will have wasted time that could have been used to gain a mark elsewhere. If you put down two terms and one is wrong, then you don’t get the mark – even if the other is correct. So put down the one you are most confident of, and nothing else. The answer is An affricate. If you had written Voiced postalveolar affricate, you would have been describing the specific example, not the term in general. The definition covers all affricates – voiced or unvoiced and in whatever place of articulation. The postalveolar affricates may be the only ones which are phonemes of English, but there are others - think, for instance, of the unvoiced alveolar affricate in Swahili words such as tsetse. So be careful – the term must reflect the general concept expressed in the definition, leaving out any “extra” features specific to the example. a) In the new version of the exam there is no choice. You are given four terms and must define /exemplify all of them. But you don't necessarily have to do them in order - if you're not sure of one or more of the terms, write it on the paper, leave ample white space and come back to it later if you have time. And even if you do know all the answers, don't spend too much time on this one. There are twelve marks - so twelve minutes meets our “one mark per minute” aim. If you’ve not finished by the time the 12 minutes are up it’s probably because you’re struggling. In that case move on – you’re more likely to pick up marks by doing the later questions thoroughly than by spending more time here. b) On the other hand, if you find the task easy, don’t get carried away and try to write everything you know on the topic. Give a clear definition and one example only. Once you’ve stated these, there are no more marks to be had, so you’re just wasting time which can be better spent elsewhere. Remember though that there are two marks for the definition (and one for the answer) - so make sure it's clear and precise. Eg : Compliment –Thanks/downgrading : This cake is wonderful!/ Thanks. But it’s really simple to make. Learning style : The individual style in which someone learns. Learning style : The typical approach (including methods, activities, procedures etc) which an individual tends to favour / find most useful in order to acquire information or skills. Obviously, the definitions have to be accurate. Those in the following examples are not. What's wrong with them and how would you rephrase them? A cloze test : A test involving a text from which individual words have been removed. The student must then read the passage and replace the words. Topic sentence : The opening sentence of a paragraph. You’ll find the answers if you scroll down to the end. So how can you prepare for these questions? 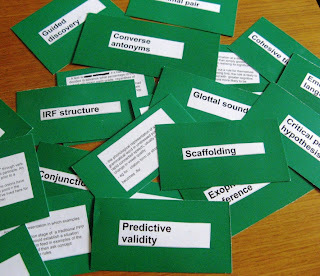 As you prepare for the exam, while you're reading or as you go through your course, make yourself a set of terminology cards, like the ones in the photo above. On one side write the term, and on the other a definition (without using the term), and an example. Keep the cards in a box on your desk, and every day, take ten or twelve of them at random and put them in your bag. Every time you have a moment during the day when you have nothing else to do - for example when you're waiting for the bus or in a queue at the bank, take a few of the cards out and test yourself. Either look at the side with the definition and see if you can remember the term, or look at the term and see if you remember all the information on the other side. Alternatively you can do the same thing on the net using sites like Quizlet or Quia Web which allow you to create matching activities, multiple choice tests. missing word tests or whatever. You’ll find a lot more examples and advice for both these questions and all the others on the two papers in the various documents published by Cambridge English. If you haven’t already done so, look at these carefully between now and the exam. You can download them all from the Cambridge website. Follow the link to see what is available. In particular though, make sure you look at the Handbook for Tutors and Candidates, which contains full details of the requirements for each question and the marking scheme, as well as suggested answers to tasks and a useful analysis of strong and weak answers to past questions. And of course - don't forget the ELT Glossary on this site. Look at the lists of terms, choose one, write a definition and example, and then click to compare your version with the answer. In the next article in this series, we'll look at the requirements of Paper One, Task 3.
a six-week online exam preparation course for people who have been self-preparing or who did a course a while back and now need a "refresher"
See our website The Delta Course for full details. How did you do with the definitions? a) Cloze : This one was too generic. It describes any type of gapped text, not a cloze test in particular. It also reuses the word "test" rather than defining it. A better definition would be : An activity used to measure reading comprehension in which words are removed from a reading passage at regular intervals – eg every 7th word, or every 9th word. The reader then has to replace the words. b) An error : Two problems here. Firstly, mistake is used as a synonym for any type of inaccuracy, including error, rather than for another, distinct type of inaccuracy. And secondly, it’s too restrictive. An error isn’t always structural – learners may make lexical errors, word stress errors or whatever. So, a more accurate definition would be : Inaccuracy in speech or writing due to lack of knowledge of the language item needed. c) A topic sentence : Whilst topic sentences are frequently found at the beginning of a paragraph, first sentences are not always topic sentences and topic sentences may also occur in other positions. And even if the assertion were true, it would still be only half the definition as no mention is made of the function of the topic sentence. A better definition would be : A sentence (often the initial sentence) in a text or paragraph which introduces and/or summarises the main idea or argument of the text/paragraph. So you think you know about Paper One? So you think you know about Paper Two?